When I first started seriously looking into food storage back in 2007, I had no clue how to use oxygen absorbers. As I learned more about storing food, I quickly learned that using oxygen absorbers to package dry foods you buy in bulk is an inexpensive way to begin a basic food storage. But in order to do so safely, you must know how to use oxygen absorbers the right way. 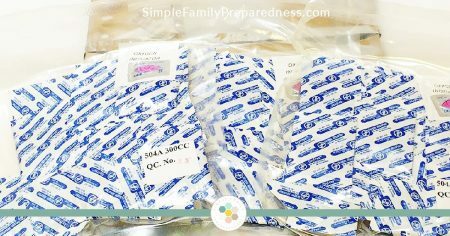 As I have taught classes on food storage for various groups, I’ve realized that there are some misunderstandings regarding how to use oxygen absorbers safely. I want to be certain that those who choose to follow and trust me have the information they need to use oxygen absorbers in a way that will safely preserve their food. 1 – What are oxygen absorbers? Oxygen absorbers are harmless little packages of iron powder. They are non-toxic and BPA-free. They are used to remove oxygen from air (which is 21% oxygen with the rest being mostly nitrogen) when packaging dry foods. When you put an oxygen absorber in an airtight container, the oxygen in that container “sticks” to the iron in the oxygen absorber. This leaves only nitrogen in the air (which doesn’t affect your food). 2 – Why should I use oxygen absorbers? An important part of knowing how to use oxygen absorbers safely is knowing why they are used at all. To prevent mold or bacteria growth in your food. Nothing will grow without oxygen to feed on! To kill pest eggs that may be found (but too small to see) in your food (usually grains). These eggs cannot hatch/multiply without oxygen. Most dry foods have a pretty decent shelf life (one-five years) all on their own without an oxygen absorber. If you plan to rotate through your foods regularly, you don’t necessarily have to use an oxygen absorber. However, if you choose to (and they are quite inexpensive), you gain the benefits listed above. Tip–You can also kill pest eggs by putting your food in the freezer for 48 hours. 3 – Where can I buy oxygen absorbers? There are many places to buy oxygen absorbers online. You can find them on Amazon at Honeyville Grains, Emergency Essentials, and the LDS Store among many others. You can also sometimes find them at Walmart (especially if you live in Utah or Idaho) or WinCo. I’ve found that the LDS store is typically the least expensive. 4 – What type of containers can I use with oxygen absorbers? Mylar bags should be at least 5 ml to adequately keep your food protected from light, oxygen, and moisture. However, even at 5-7 ml, they are easy to puncture and not even close to rodent-proof. They should be used inside of a food-grade bucket or other rodent-proof container. Two good places to get mylar bags are Discount Mylar Bags and Mylar Bags Direct. Mason jars keep food dry and fresh, can’t be punctured, and are rodent-proof. However, they are not very earthquake (or child/pet) proof as they can shatter. They also do not keep light out, so they would need to be stored away from light. #10 cans keep oxygen and moisture out, cannot be punctured, and are rodent, earthquake (as much as possible), child, and pet proof. In addition, when I open them, I only have 11-12 cups of food to get through before it expires as opposed to 90+ cups in a 5 gallon bucket. However, you have to have special equipment to seal them. This equipment is extremely expensive. You used to be able to rent the equipment from LDS Home storage centers, but they are phasing that out. (You currently [November of 2016] still can in 12 of their centers, but you won’t be able to for much longer.) Find up-to-date information HERE. Plastic buckets are tough to puncture, and rodent, earthquake (as much as possible), child, and pet proof. However, plastic buckets do not keep oxygen and moisture out as well as the rest of the options do. As a result, you will want to use them in combination with mylar bags. In addition, since you will likely need to get into/out of your bucket many times (once opened) to get through all that food, I suggest using them with a gamma lid. Gamma lids seal out oxygen, but can be screwed on and off. Each time you open your bucket, simply check your oxygen absorber to see if it is hard. If it is, it will not absorb any more oxygen. When it is hard, take out the oxygen absorber and throw a new one in before screwing the lid back on. Note: You can find some airtight plastic PETE containers, but most commonly used HDPE 5 gallon buckets are not completely air tight and will continue to let oxygen through (though in small amounts). Do not use zip seal plastic bags. Do not use non-PETE plastic containers without a mylar bag. 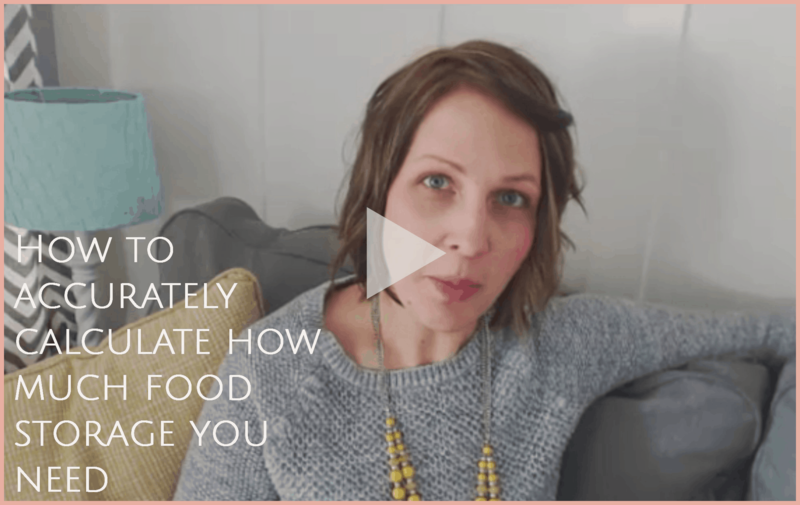 5 – What types of food can I store with oxygen absorbers? When learning how to use oxygen absorbers, I believe this is the most important thing to consider. Oxygen absorbers can only be used on DRY foods (10% moisture or less). If you package moist foods using an oxygen absorber, you run the risk of botulism. You should also avoid oily foods. Now, you will find varying opinions on this. Some websites recommend storing many of the above ingredients with an oxygen absorber. There are many “preppers” who will tell you that they’ve stored the above items with no issues–and I don’t doubt that they have. When I say that you run a risk of botulism, I don’t mean that you WILL get botulism. In fact, it would be rare. But for me personally, I tend to be very cautious when it comes to my family’s health and the food I spend my money on. I don’t want to waste that food by packaging it incorrectly. I also trust the LDS church as a solid reference when it comes to food storage. They have been recommending food storage to their members for a long, long time, and I trust their research is accurate. 6 – How many oxygen absorbers do I need? 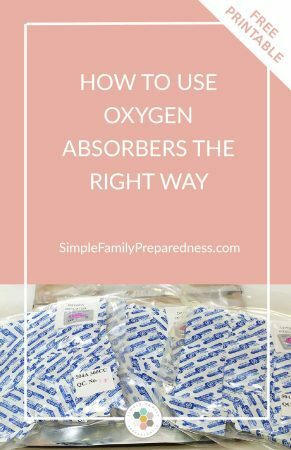 This is the most common question I get when it comes to how to use oxygen absorbers. And honestly, it is very hard to know exactly how large or how many oxygen absorbers you need. It will vary depending on the container size, how much open space you leave at the top of a container, as well as the density of the food you are packaging. While you don’t want to waste money using too many oxygen absorbers, it is better to use too many (or one that is a little too large) than too little. A little extra won’t hurt your food. But if you use too few or use one that is too small, there will still be oxygen packaged with your food. You may not kill all pest eggs and/or bacteria and you may lose more flavor and vitamins. For quart containers or smaller, a 100cc oxygen absorber will work. For containers larger than a quart and up to 1 gallon, 400 cc absorber will work. For containers larger than a gallon and up to 5 gallons, 400 cc’s per gallon will work. For 5-6 gallon buckets, a 3000 cc will work. 7 – What are the actual steps for How to use Oxygen absorbers? Make sure the containers you plan to use are clean and completely dry. Make sure the lid is nearby so you can quickly seal the container once you add the food and oxygen absorber. Make sure your food is free of any debris (common with beans). Then add it to the containers you’ve decided to store it in, but do not put the lid on yet. Step #3 – Set aside a mason jar (and lid) for oxygen absorbers. Oxygen absorbers will begin to soak up oxygen immediately. You will need to work quickly. But one tip that can help is to store any absorbers you aren’t currently using in a tightly sealed mason jar. Pull out one oxygen absorber and seal the rest in your mason jar. Add the one oxygen absorber to your first container. Tip #1 – Oxygen absorbers should feel like they have something soft and powdery inside. If you have one that feels hard or chunky, it has already absorbed all the oxygen it is going to absorb–chuck it. Tip #2 – Oxygen absorbers will heat up as they start to absorb oxygen. So if you are handling one that is warm, that is a good sign it is working. Just get it sealed up asap! If it gets hot, I’d toss it. Label your food. Make sure you include what is in the container as well as the date you packaged it. It can take up to a few days (even a week) for the oxygen absorber to remove all the oxygen in the container. If you are using cans or jars, everything should be fine. But if you are using mylar bags, you will want to check that your seal was good. Remember that oxygen absorbers use up oxygen, not air. Air is only 21%(ish) oxygen. This means that nearly 80% of the air will still remain. So, your packages may not look like they’ve been vacuum sealed. However, there should be a slight reduction in the residual amount of air in the bag (and if you forced as much air a out as possible before you sealed it, the package may look vacuum sealed). If you do not see at least a slight reduction in the amount of air in the bag, open it, add another oxygen absorber and re-seal it. This step is important because if your oxygen absorbers go bad it won’t matter if you know how to use oxygen abosrbers or not! Make sure to store your leftover oxygen absorbers in an airtight mason jar. They should last six months-one year. Be sure you check them again before you use them (if they are hard or chunky, toss ’em out). 8 – Do oxygen absorbers and the FoodSaver do the same thing? Many people assume that oxygen absorbers and a FoodSaver do the same thing. They don’t. 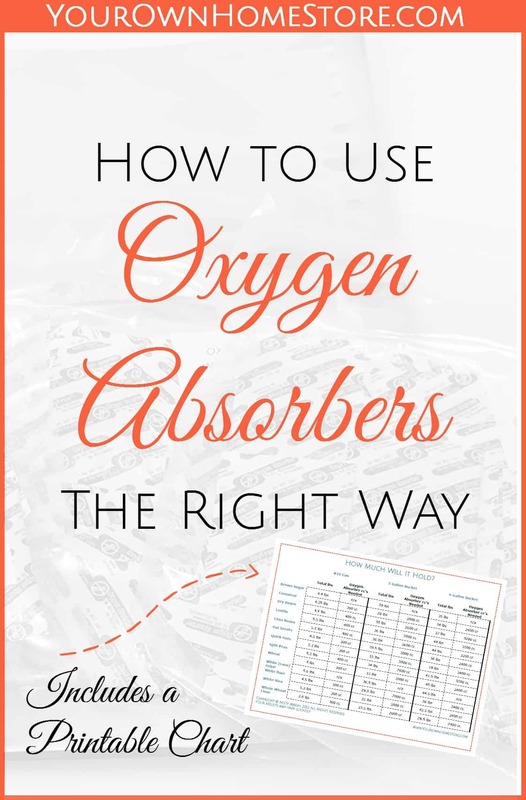 It is important to know the difference when learning how to use oxygen absorbers. Oxygen absorbers remove oxygen. In fact, they remove essentially ALL oxygen (99.99%) which is requiryeped for long term storage of foods (0.01-0.02 % oxygen left is the safe range). The FoodSaver removes air (oxygen, nitrogen, and a little of other things) through a vacuum. It does not remove ALL oxygen (even the FoodSaver website says it removes “most of the air from the sealed container, thereby reducing [not eliminating] oxidation“). However, this does NOT mean that the FoodSaver is useless. In fact, the exactly opposite is true. Remember those items that can’t be stored in an oxygen-free environment (those with a high moisture or oil content)? Well, those items CAN be stored using a FoodSaver! YAY! And while you won’t get a 30+ year shelf life out of them, you will increase the shelf life by about three-five times. 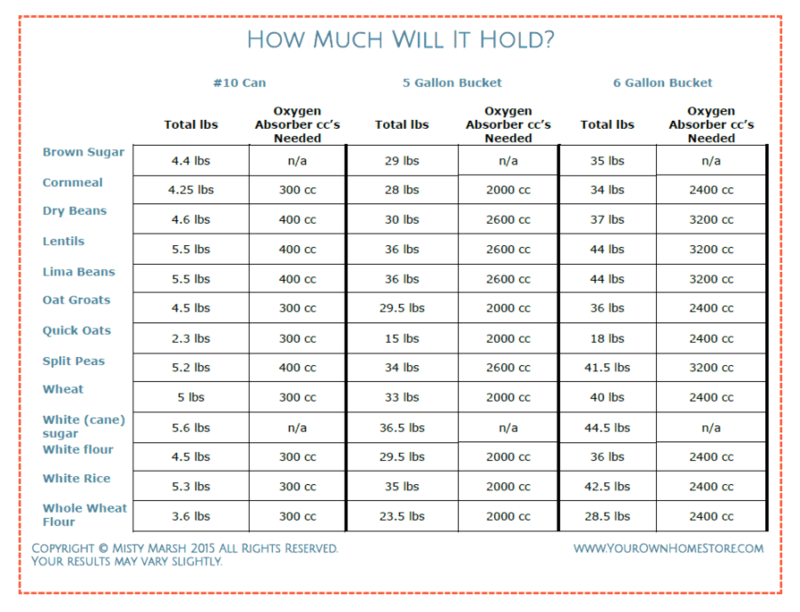 You can find a great chart HERE which will tell you how long your food will last when sealed with a FoodSaver. 9 – How to use oxygen absorbers vs how to use Silica gel/desiccants? When I first started working on my food storage, even the term “oxygen absorber” was completely new to me. I had no idea that there was another, simliar little package you could add to your food called a Silica Gel Packet or a desiccant. Silica Gel packets/desiccants remove moisture. However, you can’t use a Silica gel packet to remove enough moisture to safely package moist foods (see list above) with an oxygen absorber. My favorite use for Silica gel packets is in opened #10 cans of freeze dried food. Freeze dried food has had nearly all the moisture removed, and as it sits in an opened #10 can, it will start to absorb moisture from the air. This changes the texture and can shorten the open shelf life. But throw a few 10 gram packages in the can, and you’ll fix the problem. Just make sure you replace them every few weeks (or more often if you live in a very humid environment). Silica Gel Packs are also often used to keep ammunition and firearms, silver, tools and important documents dry as well. They can also be used to dry up a wet cell phone! Any questions left over about how to use oxygen absorbers after that big ‘ol long article? Let me know in the comments! Can you use 02 obsorbers with a vacuum sealer for extra protection. I was told not to. Is it possible to use an oxygen absorber in a mason jar and then vacuum seal it for dehydrated food? I was planning on using “Simply Orange” gallon juice containers for food storage. Are they ok to use and how much oxygen absorber should be used? Thanks for this article. It is helpful for this newbie! Thank you so much for the clear and concise information! You are wonderful! Blessings to you and your family! You mention not to use zipper-seal bags, but not why. Do you have more information on that (they are what I was planning to use)? Thanks! Once a package of oxygen absorbers has been opened, the dot indicator turns from pink to blue. I sealed the leftovers inside a mason jar right away… But the dot on the indicator paper is still blue. Are the absorbers still good for future use if I used a food saver to remove the oxygen from the mason jar right away? Thank you so much for this article. It is very informative! Hello. Thanks for your article. You mentioned that the oxygen absorber takes a few days to a week to start working effectively. And I have seen scientific articles with tables that tell you which ones you should get depending on wether you want to get rid of the oxygen immediately or more slowly. My question is: after the oxygen absorber starts to do its job, how long are the sachets used before they have to be replaced? So when should you replace them? If you seal something with an oxygen absorber and later open it, you will not be able to re-use that absorber. And if you seal something, no oxygen can get in – the one you use will absorb all the oxygen inside the can. Excellent information! I don’t know why I sometimes get confused. This article is very clear and helps tremendously. Quick question: what oxygen absorbers should I use with mason jars? I read an article today. 08/06/2018. Do not mix them. The absorber will disfunction because the silica will damage it. I just read an article today, 08/06/2017. Not to do this, the silica will removed the active ingrediant from the absorber and product will be reuined. I am from Australia, and my Wife & I do a lot of preserving. I got a Tin Can Sealer and would like to start on Bult Dry type foods as they come on special. (Brown Rice is one of these). As the LDS Church say not to use Oxygen Absorbers, What added insurance can I use. Brown rice is simply something that is not safe to can without oxygen. It is just hard to store long term b/c of the higher oil content. I would can white rice instead. You could also parboil the brown rice (cook it halfway) and then dehydrate it and then can it, but that is a lot of work! This is a great article I’m very thankful you shared your knowledge with me. I am going to save this and share with my fellow sisters when we do our next food storage order. I am so glad I found and followed your website, as I have increased in my knowledge of storage from you. I do. i hope you will continue to educate the dedicated who follow your posts. Yay! I’m so glad it is helpful Debra!